American Ultra is Hollywood’s latest stoner movie, and it stars Jesse Eisenberg, alongside Kirsten Stewart. They play a twenty something couple with a shared love of smoking pot, and hanging out. But all is not what it seems. Mike (Eisenberg) is a CIA agent, although he doesn’t know it yet, and when government sanctioned killers are sent to take him out, his training kicks in. His girlfriend Phoebe (Stewart) is caught up in the action, and their small town descends into anarchic, and frequently psychotic, violence. But it’s not really the narrative that interests me; American Ultra isn’t a particularly imaginative film. It’s the sense that this is truly a pop culture tract, populated by famous faces, reprising famous roles. American Ultra is a meta piece of cinema, although I’m not sure how intentional it is. Take Eisenberg and Stewart; suspend your knowledge of time and they could be continuing their love story from Adventureland. That interests me as a concept, and it seems that most of the characters in American Ultra belong to other film and TV narratives. There’s Topher Grace playing a malicious (perhaps dirty) CIA chief. He seems to be channeling Eric Foreman from That 70s Show. There’s also Connie Britton from Friday Night Lights, and she’s unchanged since leaving her husband and his football obsession, to take a job in the CIA. Walton Goggins as psychotic CIA spook ‘Laughter’ in American Ultra. 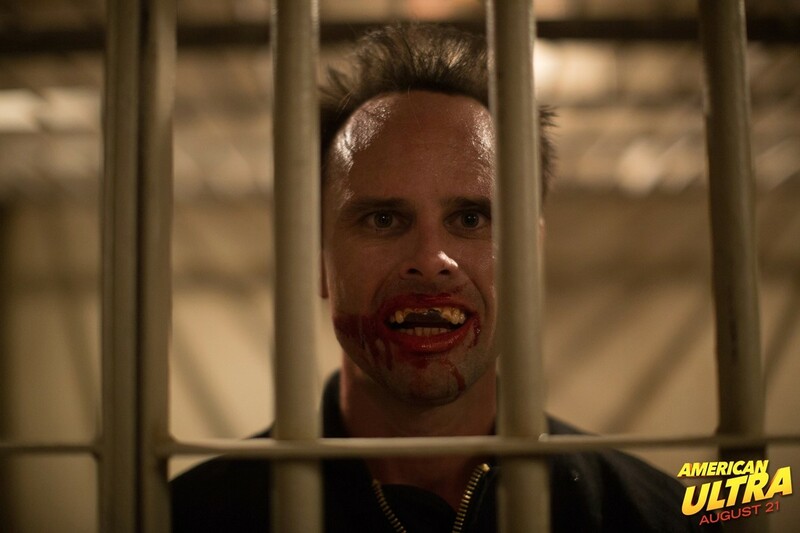 Walton Goggins makes an appearance as a trained spook, recruited from a mental home, and it’s easy to imagine that, after the events of Justified, he ended up here, hunting recalcitrant stoner spies. Tony Hale (or Buster from Arrested Development) appears as a conflicted CIA agent, trying to locate his sense of morality. Although he still has both his hands, ‘Buster’ could’ve accidentally wandered from the imagination of Mitchell Hurwitz, mistaken Eisenberg for Michael Cera, and ended up in American Ultra. Finally there’s John Leguizamo, who plays Mike’s drug dealer. His performance is identical to his depiction of meth dealer ‘Spider Mike’ in Spun. And, the closing credits of American Ultra play out over an animation sequence reminiscent of the same film. American Ultra is a bizarre bricolage of faces and references, recognisable from other mass media film and TV. There’s a sense that we’ve fallen into a world of signs, where images point to fictional stories, rather than anything from our reality. And sadly, that’s what the film made me think of. I was sucked into an alternate universe, a place populated by my ‘friends’ from film and TV, in new jobs, but unchanged all the same. It doesn’t reflect well on the film itself because it failed to add anything new to the characters I already know. Effectively American Ultra is a sequel to Adventureland, by way of Observe and Report, Pineapple Express, and The Bourne Identity. It’s not essentially a bad movie, but it’s not a good one either. It has a strong central pairing in Eisenberg and Stewart, and the first half of the film is more than passable. But the mid point, with its obligatory twist, lets down the effective pacing that characterised the opening scenes and sequences. In fact there’s some charm and originality to the earlier moments in the film, but it’s quickly squandered by exposition heavy dialogue, and the overtly violent fight sequences that define the second act, and of course, the final confrontation. Artistic aesthetics in American Ultra’s cinematography. But in actuality it’s just a genre piece, and not a particularly good one. Stoner films should be funny, but American Ultra is just nasty. It’s full of dark malicious violence, and the breezy stoner tone of the first act quickly gives way to a cold, clinical, and sadistic spy movie. There are some epic shoot outs, there’s good use of montage and vignette, but the lack of development in terms of the characters, makes it all ultimately meaningless. There is some nicely written dialogue at the start of the film, and the violence is well choreographed, but American Ultra feels like a rehash of stories and character types we’ve all seen before. Nima Nourizadeh (Project X) directs American Ultra with little imagination, and although some of the action sequences are well crafted thanks to slick editing, ultimately Mike’s identity crisis is mirrored in the film itself.